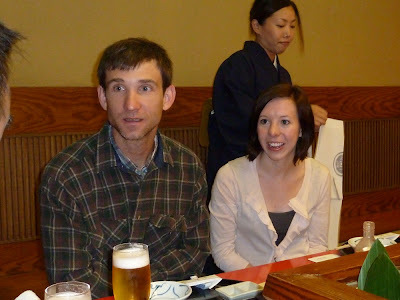 Speaking of language, while in Japan my mouth kept spitting out spanish words and phrases. Como esta? 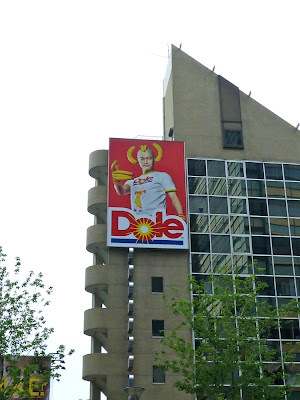 Me llamo es Jaime. Toca la guitarra! Wrong country lady! 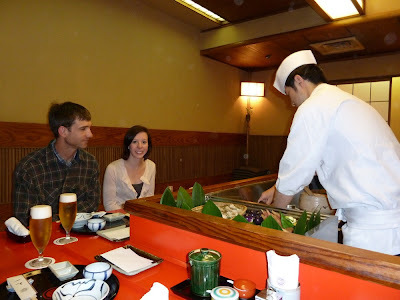 So back to the point of this post: the BEST part about Japan was the FOOD. We ate and ate and ate and ate and ate some more. 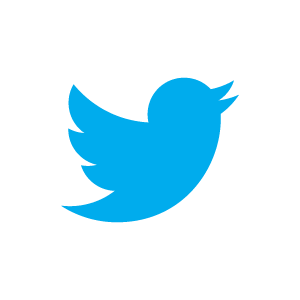 But, guess what? We never ate sushi! Apparently Japan has a lot more food than just sushi :) But before I get started on all our amazing meals, let me tell you a little bit about our in-flight service on Korean Airlines. I got a few snarly looks when I told people we were taking Korean air. I have no idea why because it was THE BEST plane ride I've ever been on. I thought it would be an icky combination of miserable and scary. It was the opposite. I was in high heaven. Literally. We were served two meals: the first was a traditional Korean meal called "Bi Bim Bop" which included white rice, beef, mushrooms, green onions, noodles, kimchi, and soup. It sounds normal, but it was one of the yummiest dishes ever. The second meal was chicken, broccoli, carrots, a dinner roll, and strawberry cheesecake. Steve had shrimp pasta. YUM! In between these two meals we were served juice and a banana or a hot roll with beef in the middle (sounds gross, but it was my most favorite snack of all time!) Before the service, they passed around hot towels, and after the service they came by with coffee, tea. AND all of this was FREE. AND we got free beer and wine the entire time. AND Steve knows how to speak a little Korean, so we made friends with the flight attendants. Two more things: when we got on the plane, we each had a blanket, pillow, headset, slippers, toothbrush, toothpaste, and bottle of water waiting at our seat :) And lastly, free movies!!!!!!!! In between sleeping and reading, I watched Whip It, Dear John, Valentines Day, and Its Complicated. Whoo!Okay, so that was my little experience with Korean food. Our first meal in Japan consisted of candy and weird snacks. We adventured down to the nearest convenience store and stocked up on chocolate, dried fish, mixed nuts, and other sweet treats. All of which had funny packaging or just sounded really strange. Crunky was my absolute favorite. Mostly because it said "Good me!" on the package and its called Crunky. Steve's favorite was probably the teeny tiny Apple Pie squares. It's a piece of candy about 1 inch square, that tastes exactly like a morsel of Apple Pie. Our hotel served breakfast every morning. I was thinking it would be fruit and bagels, but it was an entire MEAL! Rice, mini hot dogs, salad, two types of soup, boiled eggs (or raw if you prefer), cereal, yogurt, donuts, bread, bagels, these weird bean things, coffee, tea, and orange juice. 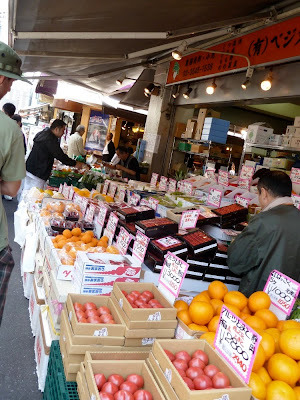 Speaking of fresh fruit, fruit in Japan is very very expensive!!! 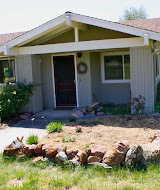 We saw a cantaloupe for $50.00!! 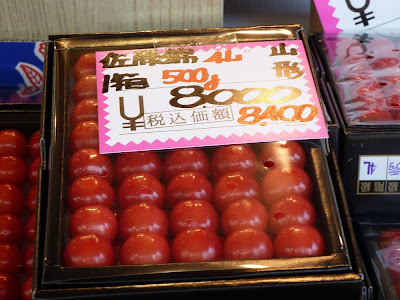 Here are some cherries for 8000 yen, which is about $80.00!!! No wonder they never served fruit at our hotel breakfast. We definitely take fresh fruit and vegetables for granted here on the Central Coast. We can go to farmers market and get a basket of cherries for $3.00! 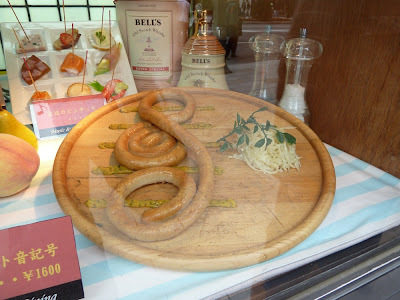 Another interesting thing about food in Japan is the plastic food models! 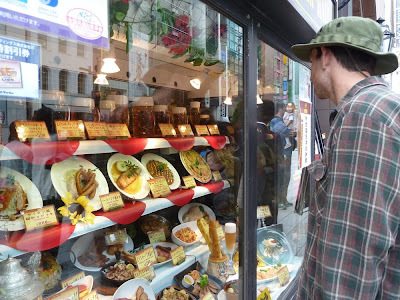 In addition to flyers and posters and menus outside restaurants, they have plastic models of their dishes outside on display. Some restaurants didn't have English menus so this made it easy to decide what to eat. The models look SO real. Some dishes looked freakish and weird dishes, and others looked soo yummy. 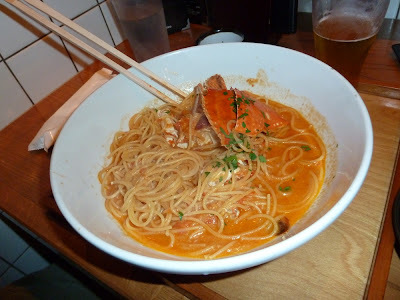 On our first outing through Roppongi, we saw a food model with a whole crab on top of noodles. Steve knew right then that he HAD to have it. So that night, we found the place again and tried this delicious pasta! I had the eggplant, tomato pasta. It was similar to our spaghetti, but with an asian flare! 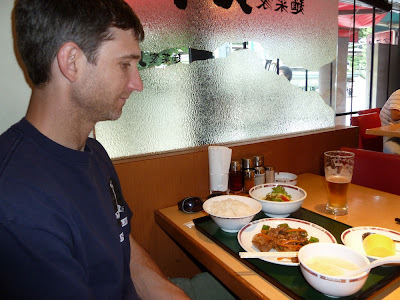 I think my favorite meal we had was our first lunch outing in Harajuku. Steve got beef over rice with soup and salad. I got egg and veggies over rice. It was simple, but SO yummy. 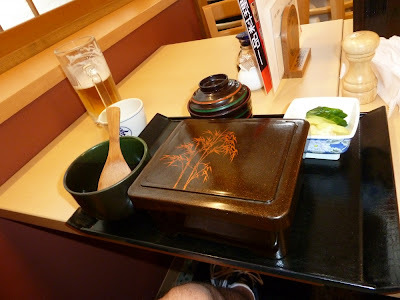 One of the quaintest thing about eating out at a restaurant in Japan is all the cute little dishes they use. Everything comes on its own dish on a tray. 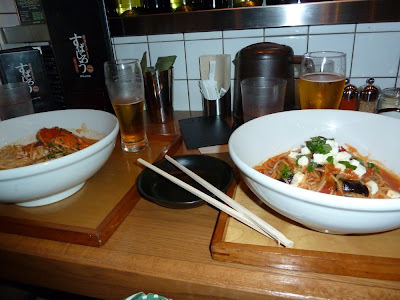 The tiny bowls and chopstick holders are so cute. 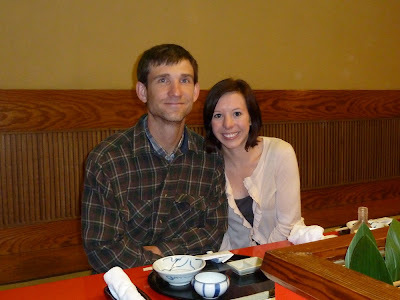 I told Steve we could have a Japanese themed dinner and have lots of little side dishes and use our new Japanese china! 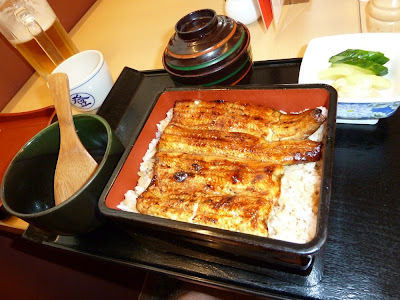 Speaking of pretty dishes, during our time in Shinjuku, we tried grilled eel. The eel came in a lovely little box. They had all sizes - small through extra large. This is the regular size box and the eel was grilled to perfected and oh so tasty. It tasted like a very mild white fish. It was served on rice with a side of salad and soup as usual. Tea is served at every meal. 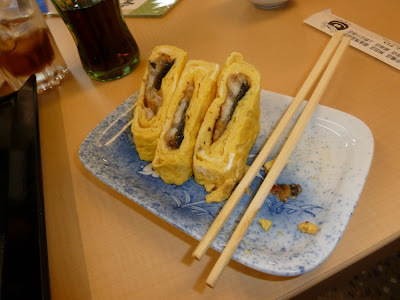 I ordered a Japanese omelet which is grilled eel inside an egg. I ordered a "Kora" with my meal - which is cola. I think they labeled it as "kora" because that's how they pronounce it! 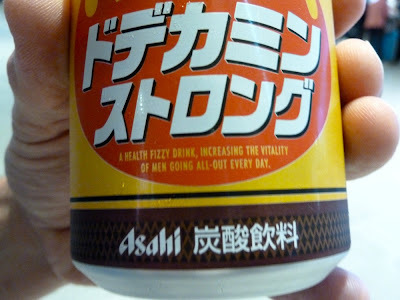 Japan is full of awesome beverages. 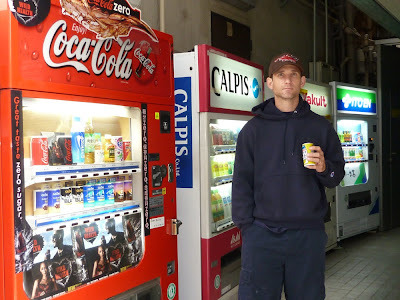 They had vending machines on every corner filled with japanese tea, iced coffee drinks, sodas, different juices and flavored water. 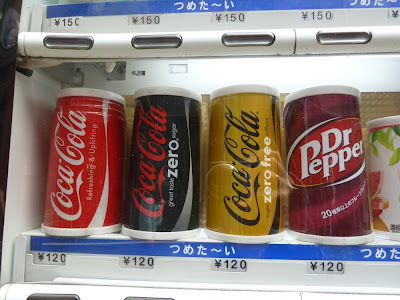 The only western thing we really saw was coke zero and I saw Dr. Pepper once. 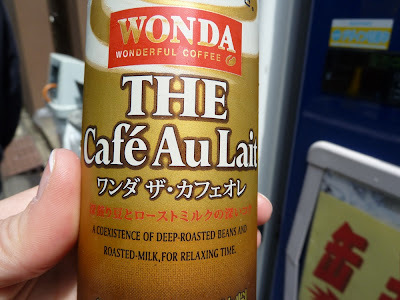 We tried so many different vending drinks - I think my favorite were the iced coffees, "for relaxing time". Most of the bevs and interesting and humorous sayings written on them which made them even more enticing. 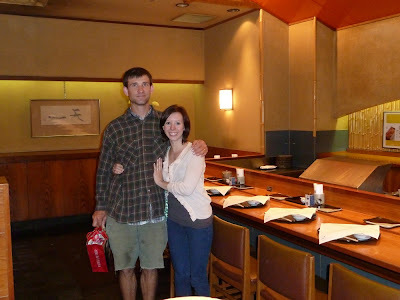 Steve fell in love with Japanese beer and drank Asahi and Sopporo daily. 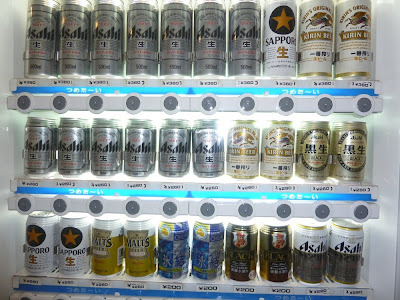 We even had an alcohol vending machine in our hotel. They had everything like beer, whiskey and water, and lots of fruity alcoholic drinks like my personal favorite, peach flavored Slat. Great name, huh? 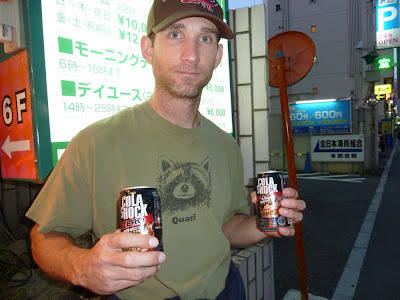 On our last night out in Roppongi, we ran around the town with "Cola Shock" in hand. Vodka and coke in a can. One of the BEST mixed drinks ever. One of the last treats we had we got from one of the subway stations. The Japanese stations are sooo nice. They all have little malls in them with lots of good stores, restaurants and treat shops. We picked up some donuts for the ride home. 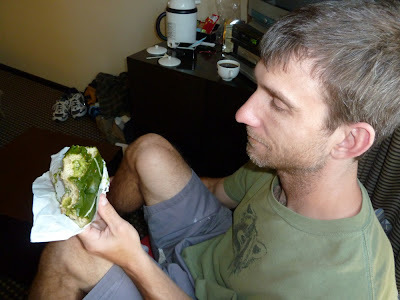 Steve got a green tea donut which looked like guacamole! Some of you may be wondering if there were lots of McDonalds around and the answer is YES. 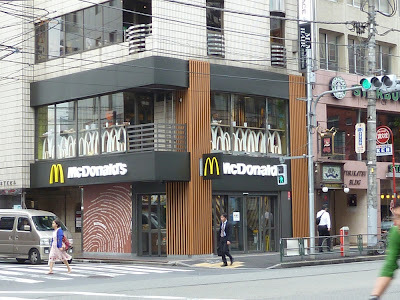 There was a McDonalds on every corner. Our work friend told us that they pronounce McDonalds like "MacDonaldo" :) How cute is that. Makes it sound super fancy. All of the McDonalds were huge and had several floors for seating. The seats were plush, modern, and they were always packed with men in business suits on their laptops. We tried a burger and fries one night when I wasn't feeling too well, and it tasted EXACTLY the same. I assumed it might be a little different, but nope! Some other popular western places were Starbucks (we saw them on EVERY block), Subway, and Wolfgang Puck. I also saw one Outback Steakhouse, Lawrys, and Ruth Chis Steakhouse. Japanese people LOVE steak because I think it is hard to get good steak there. Our colleague took us out a second time for Shabu Shabu. This was a real treat!! Shabu Shabu is thinly sliced Kobe beef, served raw on a plate. A bubbling pot sits in the middle of the table, and you take a slice of beef with your chopsticks, and swish it around in the boiling water for about ten seconds. Then Wa la! The beef is cooked and you dip it in a little dish with yummy sauce. It was soo delicious. We also dipped fresh veggies and raman noodles into the water and had a huge feast. It was probably one of the coolest meals I've ever had. Afterwards we tried EVERY dessert on the menu! There were these weird strips of transparent jelly that you dip in this molasses sauce. YUCK. Another one was this bean dessert, which was like soft pinto beans with sugar on top. YUCK AGAIN! Then finally we tried a yummy dessert that was a sweet jelly with a plum in the middle. My favorite was the green tea ice cream. I've never seen such bright green ice cream before. This meal must have cost a ton because I read somewhere the Kobe beef is very expensive and combined with this fancy restaurant and all the food we ordered, the bill must have been a few hundred bucks! Yikes! It was so cool that we were treated like royalty at these lovely dinners with our new Japanese friend and his beautiful wife! I can't say enough how much we enjoyed the food in Japan. We were living in Cloud 9 with full bellies every day. We needed another week just to be able to try more food!! I hope this gives you all a glimpse of our satiable experience there. ooh my gosh i want to go next time I come!